People are busier now than they’ve ever been. It has never been so difficult for people to find time to get exercise, or to find time to even just be active. But it’s so important to be active; the health risks associated with a sedentary lifestyle are quite serious, and it is certainly simple enough not to fall into that trap. There are many easy ways to boost your activity levels that don’t require you to spend too much money or to go to extreme lengths to get enough activity in your life to keep heart disease and obesity at bay. It’s been said by some that there are no shortcuts in life. The truth is, though, that there are plenty of shortcuts. It’s just that taking these shortcuts can take their toll. It’s as a result of all of these modern conveniences that it’s so easy to live a sedentary lifestyle nowadays, thanks to drive-thru windows and pizza delivery. But you can get more active by refusing to take advantage of these conveniences. 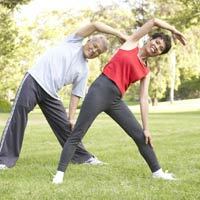 There are many easy ways to boost your activity levels by not using modern conveniences. Walk into the bank to make your deposit. Walk into the coffee shop to get your latte. Walk to the grocery store to pick up the eggs and sugar you need, or walk to a neighbor’s house to borrow some. You can also get moving by actively trying to make things more inconvenient for yourself. Instead of using the remote control, walk over to the television to change the channel. Instead of taking the elevator at work, take the stairs. Instead of parking in the ten-minute parking zone at the store, park farther away and walk all the way in. If you’re going to ride the escalator, walk up as it goes. You’ll get to your destination faster and you’ll get in a little cardio time. These are all easy ways to boost your activity levels. A little accountability can go a long way. By joining a fitness group, a group of people who will call you if you don’t show up, you’ll be more likely to exercise regularly. You don’t have to join a group of runners training for a marathon; there are plenty of groups of people who simply get together to get some light cardio, who are just like you and don’t want anything too intense. You can also join a community sports team and play a sport you love while getting exercise. Of all the easy ways to boost your activity levels, this is one of the most fun. If you’ve ever watched children playing and wished that you had that kind of energy, maybe it’s time you joined their ranks. By playing with your children, grandchildren, or even kids in the neighborhood, you’ll feel like a kid again, and you’ll be getting plenty of good exercise. This is one of the best easy ways to boost your activity levels, and it’s one of the most rewarding, too.